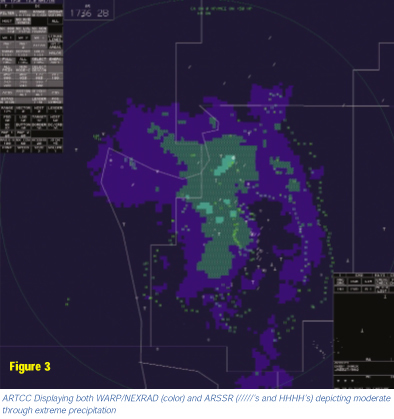 When thunderstorm season begins this year, pilots will start hearing some very important changes in the way Air Traffic Control (ATC) describes radar weather echoes to pilots. Beginning in late spring 2006, pilots will hear ATC use four terms, 'light,' 'moderate,' 'heavy,' and 'extreme' to describe weather radar echoes. Each term represents a precipitation intensity level paired with a dBZ range to help pilots interpret the severity of the flight conditions present. (A dBZ is a measure of radar reflectivity in the form of a logarithmic power ratio [in decibels or dB] with respect to radar reflectivity factor 'Z.') The four terms will be used universally in the National Airspace System (NAS) by approach controllers and Air Route Traffic Control Center (ARTCC) and Automated Flight Service Station (AFSS) specialists. The decision to standardize the terminology was easy to make because the ARTCC facilities and many of the terminal approach control facilities now have digital radar display systems with processors that can better determine the intensity (dBZ) of radar weather echoes and display that information to the controller. Most of us are familiar with The Weather Channel and local news and weather broadcasts that use the Doppler NEXRAD (next generation radar) WSR 88D weather radar. Some of you may even use those broadcasts to supplement your flight planning and overall weather awareness. However, there are significant differences with how weather information is displayed on a controller's radarscope and the local news weather broadcast depictions. NEXRAD is de-signed to detect and display weather, but ATC radar systems are designed to detect and display aircraft. Because the NEXRAD color-coding and16 individualized precipitation levels can provide excess clutter and possibly compromise the ability of controllers to safely perform their duties, different systems for depicting weather radar echoes needed to be developed for the ATC environment. In air route traffic control centers, NEXRAD data is fed through the Weather And Radar Processor (WARP) that organizes the 16 NEXRAD levels into four reflectivity (dBZ) categories. Reflectivity returns of less than 30dBZ are classified as 'LIGHT' and are filtered out of the center controllers' display. The remaining three categories correlate to bands of dBZ values to assist pilots in evaluating the severity of flight conditions that might be associated with those precipitation returns. Therefore, the wide range of color coding available to NEXRAD is not available to the controller and, as you can see in Figure 2, the ARTCC's WARP system does not display dBZ levels below 30, therefore center controllers will not be able to report areas of 'light' weather radar echoes. WARP/NEXRAD is a vast improvement over the Air Route Surveillance Radar (ARSR) display of weather radar echoes that center controllers used exclusively prior to the implementation of the NEXRAD type weather radars. The ARSR displays the echoes to the controller by indicating 'moderate' intensities with a slash mark '/'and more intense areas with the letter 'H' (see Figure 3 for an example of an ARSR and WARP display). Of course, there are no absolutes. In the universe of terminal radars, the NAS still has a few non-digital ASR systems. While these systems do a good job of displaying weather radar echoes, they lack processors that can discern the intensity of the echoes. These facilities will not be able to use the terms, 'light,' 'moderate,' 'heavy,' or 'extreme.' Controllers who work from these displays will be able to tell pilots the position of weather radar echoes but will state, 'intensity un-known' because their system does not indicate what dBZ level of reflectivity is present. 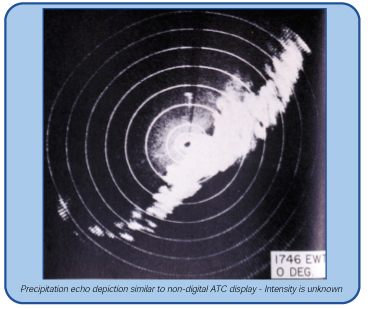 In the world of ATC, weather radar echoes are all referred to as 'precipitation' even though, technically, it is possible the echo could be associated with birds, volcanic ash, etc., or precipitation that is not reaching the Earth's surface (virga). Controllers will tell pilots the location of significant areas of 'precipitation' when it appears that it may affect the aircraft's flight path. They will also provide assistance in the form of course deviations when requested by the pilot. Pilots of light general aviation aircraft should even approach areas of 'light' precipitation with caution. A rapidly growing thunderstorm can in-crease at a rate of 6,000 feet per minute! Think of the time-lapse photographs and weather radar loops showing building thunderstorms. 'Light' precipitation could grow to 'moderate' and 'heavy' levels within a very short period of time, given the right conditions. The following tips are offered to assist pilots in navigating stormy skies safely. Request course deviations early. Don't wait until the last moment. Ask for information updates as needed. The ARTCCWARP/NEXRAD updates everyone to six minutes. Terminal (ASR based) systems show near 'real time' echoes. Make sure the controller under-stands what services you want. 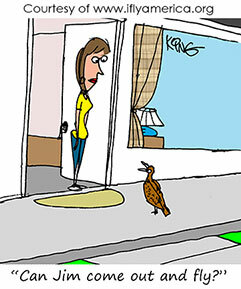 Maintain situational awareness concerning your position and the weather areas you wish to avoid. Include the information that you are on a heading assigned/approved by ATC for weather avoidance, when you report onto the next controller's frequency. Verify what additional services ATC is providing to you. Is it what you need? Pilot reports (PIREP) of flight conditions are an invaluable source of in-formation for other pilots and controllers as well. PIREPs should include reports of turbulence, icing, cloud top sand bases, intensity of rain, presence of hail, sleet, etc. A PIREP is often the only source of information regarding actual flight conditions a pilot may en-counter. Do your part for flight safety and pipe up with a PIREP! For anyone who has never submitted a PIREP, the Aeronautical Information Manual (AIM) explains how to submit one, the uses of a PIREP, and the format a pilot should use in reporting information. AIM paragraph 7-1-21, Pilot Weather Reports, is the reference. Table 7-1-6, PIREP Element Code Chart, explains the reporting for-mat with the elements explained. Christine Soucy is with FAA's Office of Accident Investigation, Accident Coordination Branch and Michael Lenz is a Program Analyst in Flight Standards' General Aviation and Commercial Division.